For those teachers taking the semester break to reflect on successes and create new opportunities, here are a few that caught our eye. Options to make your great work more visible with recognition and grants, as well as potential student projects! This year's theme: Exploration, Encounter, Exchange in History!! Registration for participation due by January 15th. If you aren't yet ready to bring students, consider applying to be a judge and be inspired by student projects! Click here for online registration and information. The 36th Annual History Day L.A. will be held on Saturday, March 12, 2016 at Azusa Pacific University, located at 901 East Foothill Blvd., Azusa, CA 91702-7000. HistoryDay L.A. is part of a national program that encourages students to prepare posters, exhibits, papers, websites, performances, and documentary presentations on a historical theme. These projects will be judged by community members and social science professionals. Participation in>History Day L.A. provides opportunities for students to meet content standards and improve academic achievement. As an authentic performance assessment measure, teachers can utilize History Day projects to easily assess the knowledge and skills of their students. Students, teachers, and parents will have a chance to view student posters, exhibits, historical performances and documentaries, attend the Awards ceremony, and tour Azusa Pacific University. This year’s theme, Telling it Forward: Making Memory Matter, challenges middle and high school students to consider their own role in history by connecting with the personal stories of Holocaust survivors and rescuers. The deadline for schools to submit entries is 2/5/16. 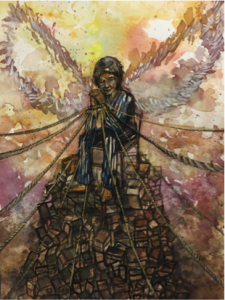 To learn more go to chapman.edu/holocaust-arts-contest or contact Jessica MyLymuk at the Rodgers Center for Holocaust Education, Chapman University at cioffi@chapman.edu. Click here for more information and to apply. Deadline: January 13, 2016. In 2014, the LRNG Innovators Challenge posed the question: What if learning had no walls, no bells? Teams of educators developed inspiring proposals to expand the time and space young people have for interest-driven learning in schools. In 2015, LRNG Innovators is challenging teachers themselves to reach beyond the schoolhouse door to develop partnerships and programs that connect in-school and out-of-school learning and create opportunities for young people to follow their interests and do ambitious work. With support from the John D. and Catherine T. MacArthur Foundation, LRNG Innovators will invest in teams of teachers committed to exploring how learning experiences can move fluidly and coherently across the spheres of formal and informal learning. Click here for applications and more information. Deadline for submitting nominations: January 20, 2016. Self-nominations are accepted. Merrell Frankel was an outstanding teacher recognized as California Council for the Social Studies and National Council for the Social Studies Middle School Teacher of the Year for her innovative instructional practices and commitment to social justice through social studies education during her career. The SCSSA Merrell Frankel Innovative Social Studies Teacher Award recognizes social studies teachers in Los Angeles County whose social studies instruction exemplifies innovative and engaging approaches to help students understand the past for achieving social justice in today’s society. The purpose of the SCSSA Outstanding Social Studies Teacher of the Year Award Program is to recognize SCSSA members whose classroom teachings and professional practices reflect the goals and purposes of an exemplary social studies education. Winners will be honored at a special luncheon event on March 5, 2016 at the California Council for the Social Studies Annual Conference in Costa Mesa. Awardees at the SCSSA local council level will move forward to be considered for the California for the Social Studies Teacher of the Year Awards. Present a Session at the 2016 NCSS Annual Conference in Washington DC! The Call for Proposals for the 2016 Annual Conference is now open. Help meet the needs of social studies educators and shape the content of the conference by submitting your proposal(s) to present. NCSS is accepting proposals in all disciplines and levels, in formats ranging from full-day clinics to new, 30-minute power sessions. Community Stories (previously the California Story Fund) is a competitive grants program to support story-based public humanities projects that collect, preserve, interpret, and share the stories of California communities—past and present. Since 2003, we have awarded over $3 million to over 400 projects through this grant program that seeks to foster greater knowledge, understanding, and empathy among us. The next Community Stories deadline is February 1, 2016. Click here for guidelines and online application.